The “Iron Warrior” Mike Christian is back on the bodybuilding scene and is ready to pick up right where he left off years ago. 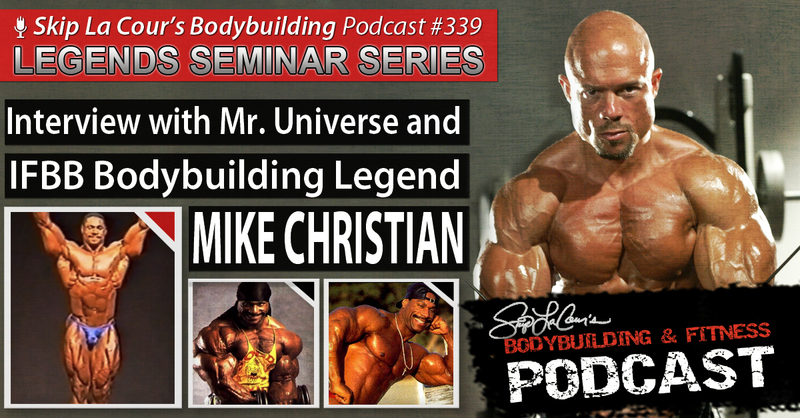 During this podcast, the former Mr. Universe openly reveals the highs and lows that he experienced during is extremely interesting journey. The bodybuilding legend talks about how bodybuilding saved him from a life of crime on the streets and how he became a huge favorite among the elite competitors of his time, the muscle magazines, and the bodybuilding fans throughout the world. Mike reminisces about how thrilled he was with his second place finish against 8-time champion Lee Haney at the Mr. Olympia and how the magazines pitted them against each other as rivals but he realized that he had gone as far as he could go. When Vince McMahon and his upstart WBF organization came around and wanted the charismatic stage showman so badly, Mike jumped all over the opportunity and the $300,000 contract he was given. Unlike many of the other IFBB professionals that took the same route, Christian never once regretted his decision. Mike also talks about the successful international gym clothing line he created, Platinum Everywhere, and all of the opportunities that it afforded him. Christian suffered a lot of challenges through his life and he tells you about a lot of them during this interview. You’ll also learn what he’s doing today and how you can contact him to help you take your own efforts to the next level. Six-time national champion bodybuilder, one-on-one peak performance coaching specialist and speaker, Skip La Cour, offers his expert advice on training, nutrition, and motivation that will help you take your efforts to the next level. He also interviews the most interesting and passionate people in the bodybuilding and fitness world so you can learn from their knowledge and success too.